The Condill family welcomed me with open arms to their Centennial farm, The 200 Acres. 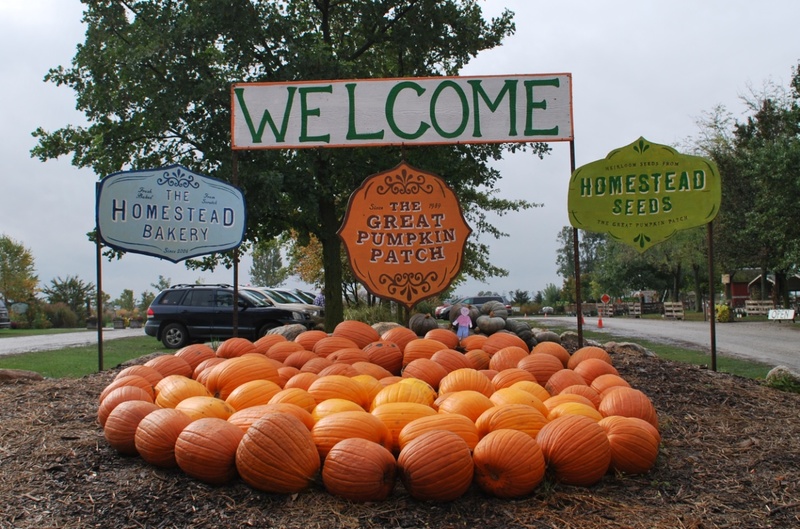 The 200 Acres is made up of The Great Pumpkin Patch, The Homestead Bakery and The Homestead Seeds. They take pumpkins all the way from dirt to dessert, from seed to a pumpkin to a pie. I am excited to show you everything I saw on my recent visit to this farm in Arthur, IL. 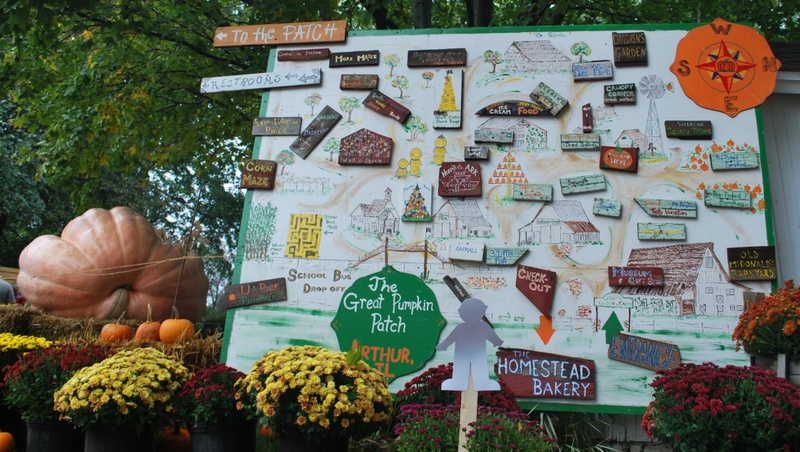 The Great Pumpkin Patch and The 200 Acres is located in Arthur, IL, the heart of Illinois Amish Country. The Village of Arthur has approximately 2,300 residents, and is surrounded by approximately 4,500 Amish residents. The Amish and “English” (non-Amish) communities are woven together in everything they do—they shop together, they work together, they even go to school together. I had so much fun at The Great Pumpkin Patch and learned so much about cucurbits- which is just a fancy word for pumpkins, squash and gourds. When I first got there and looked at the farm’s hand painted map, I wasn’t sure where to start. This is just one of 1,000 hand painted signs on the farm!! It was kind of rainy and muddy at the farm the day I visited, but I still got to walk around and see over 300 varieties of pumpkins, squash and gourds. Did you know you can make French fries and spaghetti out of squash? I also saw a blue pumpkin, can you believe it?!? A blue pumpkin!!! It is called a Jarrahdale, and it is from Australia! My friends at The Great Pumpkin Patch said that a Jarrahdale (and most pumpkins or squash) are yummy to eat. Just tell your mom to treat them like a potato when cooking them and you will get a delicious, nutritious treat. Even though it was mudd y, I still got to go out into the patch where they grow the pumpkins. Can you see the pumpkins, the vines and the flower (that’s called the Pumpkin Blossom) in the picture? 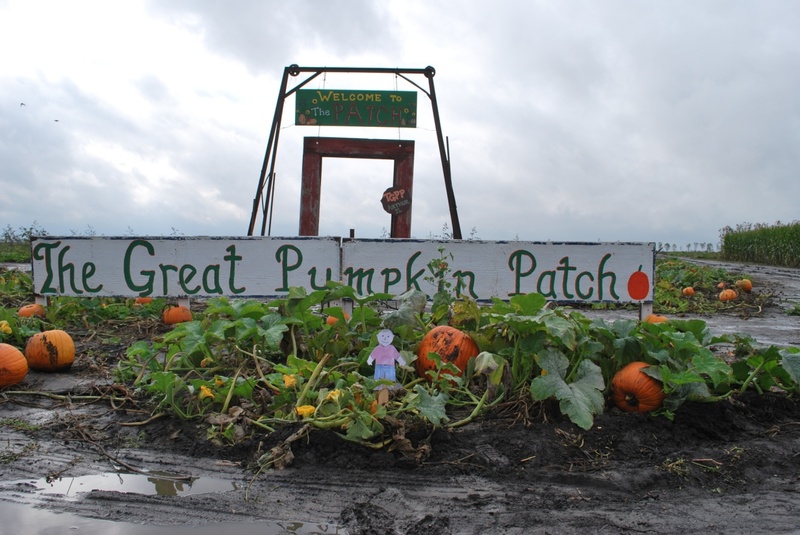 The Great Pumpkin Patch grows over 63 acres of pumpkins- that is more than 63 football fields. That is A LOT of pumpkins, squash and gourds! The pumpkin patch loves to celebrate the diversity (that is fancy word for differences) of pumpkins, by displaying them in lots of different places. 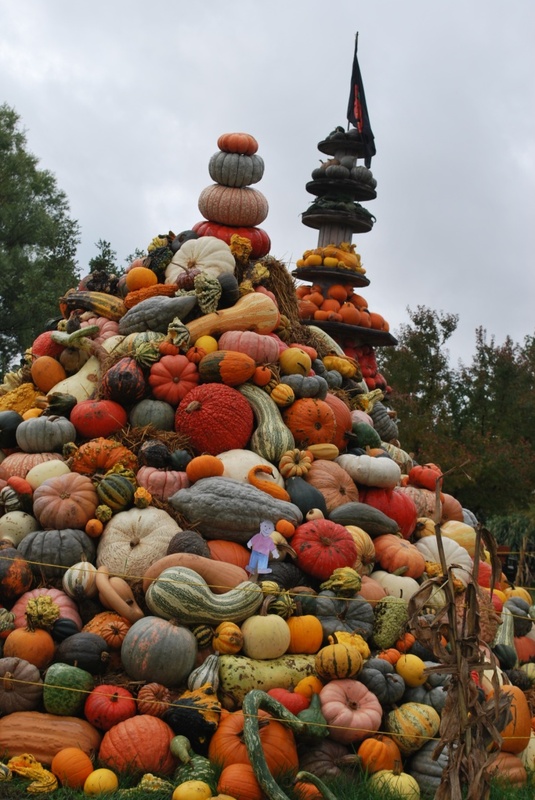 This pumpkin tower has over 800 pieces of cucurbits (remember that word? It means pumpkins, squash and gourds) in it. The Great Pumpkin Patch built a tower like this in front of The White House. Behind it, you can see the stack of recycled spools with cucurbits of many colors. I learned that there are pumpkins of every color of the rainbow. Can you see me in there? Not only are there so many shapes and colors of pumpkins, squash and gourds, cucurbits come in all different sizes, too!!! Check out the pumpkin in the picture below. 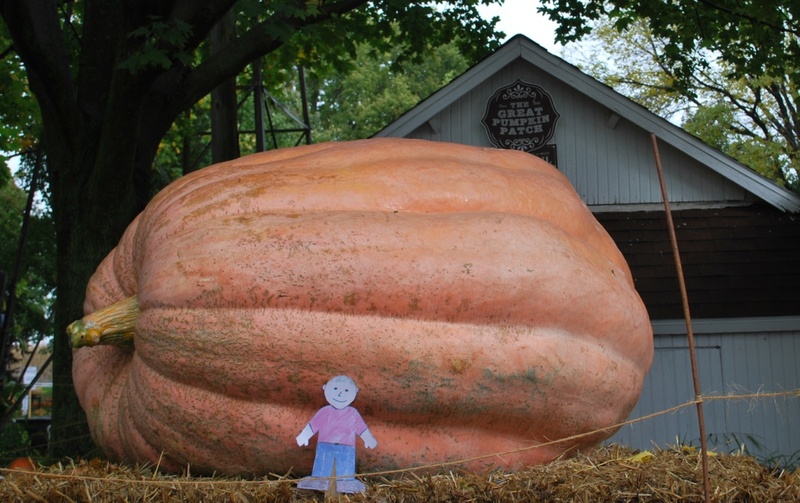 It is fourth largest pumpkin in the whole state of Illinois! Speaking of Illinois, did you know that Illinois is the #1 producer of pumpkins in the whole United States. Ninety percent of all pumpkins in the country come from here. Friends of The Great Pumpkin Patch grew this one and wanted to share it with all the visitors at the patch. Isn’t it beautiful? His name is Daddy Punkin and he weighs over 1,000 pounds! 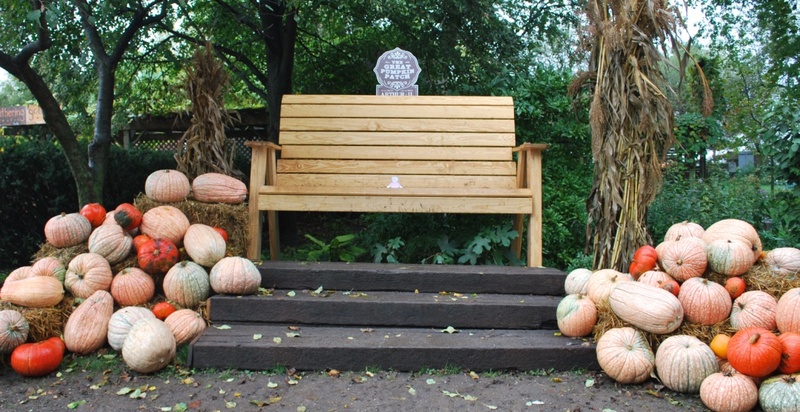 This is the humongous bench that a local Amish business made for them. Lots of people take their pictures here, and I was even told that all eight of the sixth generation of McDonald/Condill farmers sat up there at the same time!!! 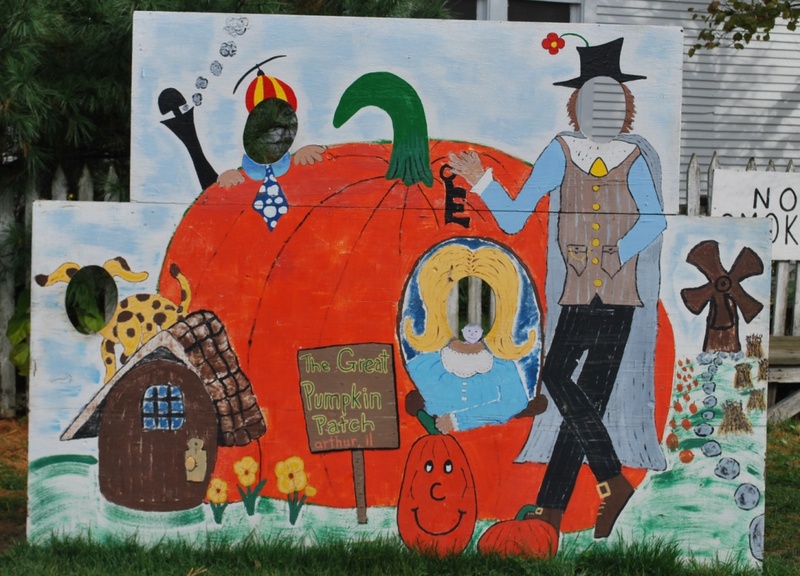 And this hand-painted scene of Peter, Peter, Pumpkin Eater is one of many “Head-pokie-throughs” (that’s what they call them anyway) at The Great Pumpkin Patch. What do you think of my beautiful blonde hair?! One last fun fact that I learned at The Great Pumpkin Patch is that the top four plants people eat are corn, beans, squash and potatoes. Over time, people have eaten more squash than potatoes!!! I had so much fun on my trip to TGPP, as the locals call it. I hope you enjoyed learning about my trip and make a trip here someday too. This entry was posted in Ag in the Classroom and tagged agrotourism, cucurbits, Flat Aggie, pumpkins, squash, The Great Pumpkin Patch. Bookmark the permalink.